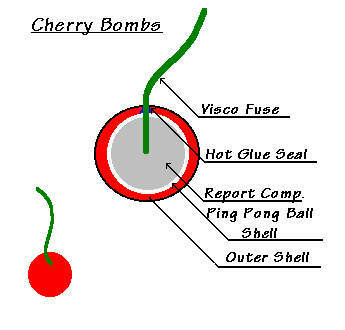 Cherry bombs are usually round, approximately one inch (2.5 cm) in diameter, and colored red with a green fuse. They contain a core made of explosive flash powder, a layer of sawdust, and a coating of sodium silicate. They are powerful enough to cause very serious injury. Considered an illegal explosive device in the United States and most other countries. Possession, manufacture, or sale of cherry bombs is a crime punishable by incarceration or fine.